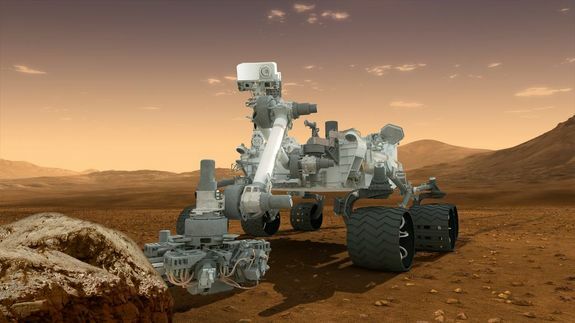 On Thursday September 11th, a special teleconference was held by the NASA Jet Propulsion Laboratory to discuss the status of the Mars Science Laboratory and the Curiosity rover. The conference featured Jim Green, director, Planetary Science Division, NASA Headquarters, Washington, John Grotzinger, Curiosity project scientist, California Institute of Technology, Pasadena and Kathryn Stack, Curiosity Rover mission scientist, NASA’s Jet Propulsion Laboratory, Pasadena. California, and marked the first direct conference on the mission hosted by JPL since the start of the year. The focal point for the briefing was to announce that just over two years since its arrival on Mars, having covered a distance of some 6 kilometres and having already fulfilled its primary mission objective – to locate a region on Mars which shows both chemical and geological indications that it may once have been amenable to development and support of microbial life – the rover had, again in geological terms, arrived at its primary exploratory target: Aeolis Mons, which NASA refers to as “Mount Sharp”. Curiosity still has around two kilometres left to drive before it can be said to be actually “on” or climbing Mount Sharp, but the changes in geology and terrain which it is now encountering are sufficiently clear for the science team to state the rover is effectively traversing the “boundary” between the floor of Gale Crater and the slopes of Aeolis Mons itself. Originally, it had been intended to drive the rover further south from its current location near an uprising dubbed the “Pahrump Hills” – originally seen as a potential target site for further sample drilling – to a series of low buttes named after the late co-founder of The Planetary Society, Bruce Murray. From orbit, this had been seen as the best route by which the rover could skirt an extended line of sand dunes lying between it and “Mount Sharp” and commence a climb up onto the lower slopes. However, further examination of the terrain adjacent to the Pahrump Hills / Zabriskie Plateau has revealed it to be softer than the terrain than the rover has been crossing, and potentially more suited to driving onto the slopes of the mound. Dubbed the “Murray Formation”, this terrain also forms a visible boundary between the Mount Rainer-sized mound of “Mount Sharp” and the crater floor sediments, and so offers the potential for further science discoveries. Thus, from a driving characteristics point of view and a science perspective, it offers a shorter, more interesting route onto the mountain proper. As well as being geologically different to the sediments of the crater floor, the Murray Formation is topographically different as well, which is driving a lot of interest in the science team in terms of what it might indicate about the way in which “Mount Sharp” was formed. The floor of Gale Crater – more correctly known as Aeolis Palus – bear the marks of considerable cratering which can be seen from orbit. However, the layers of the Murray Formation – essentially a scarp between the crater floor and Aeolis Mons – have almost no visible cratering at all. The topological differences between the plains of Gale Crater and the slopes of Mount Sharp can be seen in this false colour image. 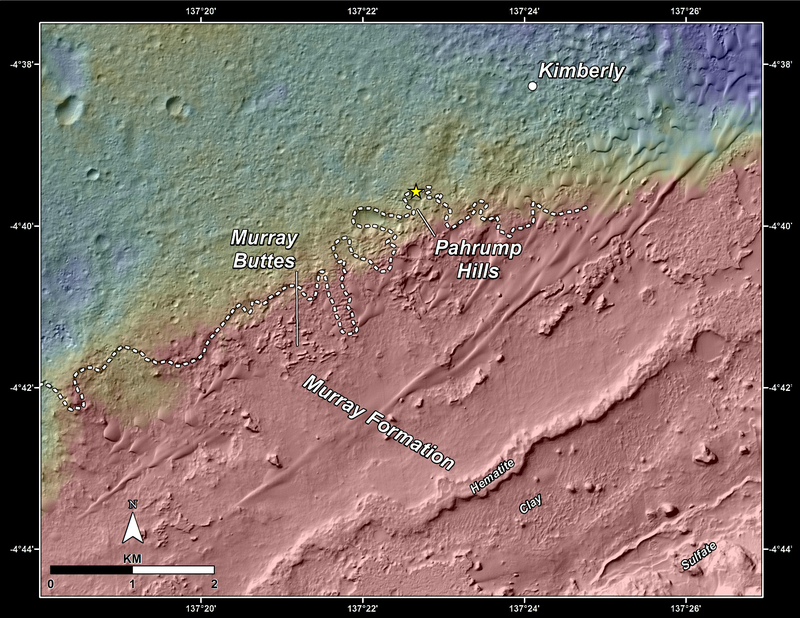 Note the rich cratering evident across the sedimentary basin of Gale Crater and the almost complete absence of cratering along the Murray Formation. During the course of the next few weeks, the rover will pass over / around Pahrump Hills, hopefully gathering a suitable rock sample using the “compressed drilling” routine,. Then it will turn more sharply southwards than originally planned, travelling directly onto the Murray Formation, rather than continuing in a more south-westerly direction to Murray Buttes before turning onto the slopes of the formation. The rover will still study the area of the Murray Buttes, but will now do so at their eastern extremes, allowing the science team to also investigate some nearby sand dunes. While “Bonanza King” proved to be unsuitable for drilling for an actual sample for analysis, it did provide sufficient data to help the team in determining a revised science programme, and in their decision to traverse the Murray Formation and onto “Mount Sharp” proper sooner rather than later. This is because spectral analysis for the rock revealed it to have very high silica content (the only location on Mars so far studied with similar levels of silica is half a world way and was studied by the Spirit MER), which stands a marked contrast to rock samples so far gathered by the rover. There was no deployment to the Main (SLS) channel on Tuesday September 9th, largely as a result of there having been no RC deployments in week 36. The Experience Keys projects viewer got its long-awaited update on Wednesday September 10th, with the release of version 3.7.16.293901. The viewer remains at a project viewer status, but now has parity with the current release viewer. There is no major news here; as noted in part one of the week’s report, the Lab are still working on adjustments to the group chat code, but according the Maestro Linden, there isn’t anything as yet ready for further testing on Aditi – although the implication seemed to be that there may well be in the near future, as the comment on the work was made in terms of “upcoming stuff”. In the meantime, people have been reporting further increases in group chat issues, prompting questions on whether increasing the number of servers used in support of the chat service might help. However, when this idea was last discussed, it was indicated that increasing the amount of available hardware isn’t considered to be a suitable solution at the moment, as it is the exponential manner in which ancillary messages (status updates, etc.) flood the service is seen to be the issue; something which just the provision of new hardware may not resolve / ease. As such, bringing the volume of the messages under better control is seen as key step in improving the service. During the Server Beta meeting the subject of restricting sounds between parcels came up, with a request for a parcel setting to restrict sounds from other parcels being heard within a parcel. Currently, there is an option to restrict sounds from objects and gestures played within a parcel to that parcel, this can be found under About Land > Sound. The question led to an experiment with this option, which revealed, to the surprise of several at the meeting (myself included), that the setting is actually bi-directional: enabling it not only restricts sounds from objects and gestures being heard outside of a parcel, it blocks such sounds played from other parcels from being heard within the parcel as well. In some respects, that the options is bi-directional shouldn’t really have been a surprise; the other parcel options of a similar nature – restricting voice, restricting avatar visibility and chat, for example, are bi-directional, so why not gestures and sounds? The option may not be perfect; looped sounds, for example, may not be restricted, and during a short test at the meeting, some indicated they could still hear a sound generated on one parcel when moving from it to a parcel with the gesture and objects sounds restriction set, prompting Maestro Linden to muse if the restriction was enforced server-side or in the viewer. However, if you are troubled by sounds from a neighbouring or nearby parcel, it might be worth trying the option if you haven’t already.